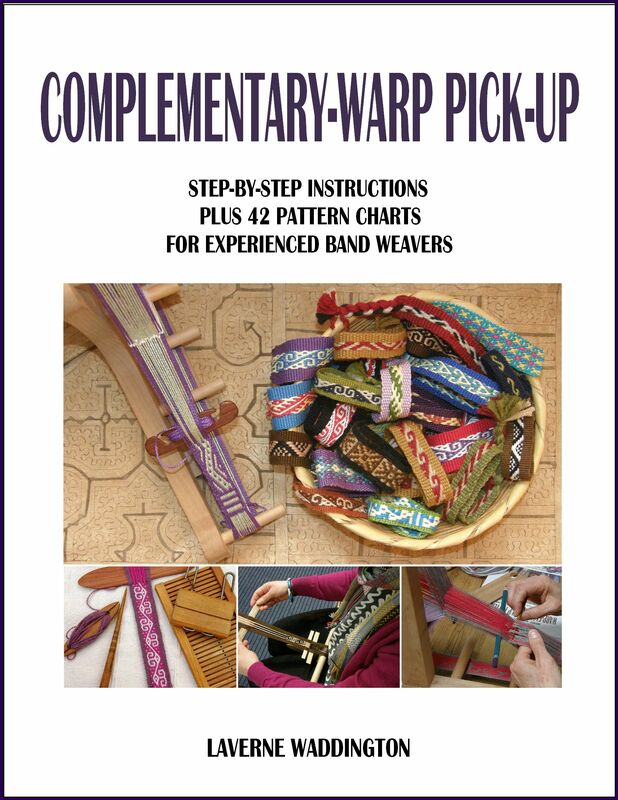 The following tutorial gives instructions for warping the traditional Bedouin pattern known as al’ouerjan. Instructions are given for creating a circular warp as well as a single-plane warp on two and four stakes. 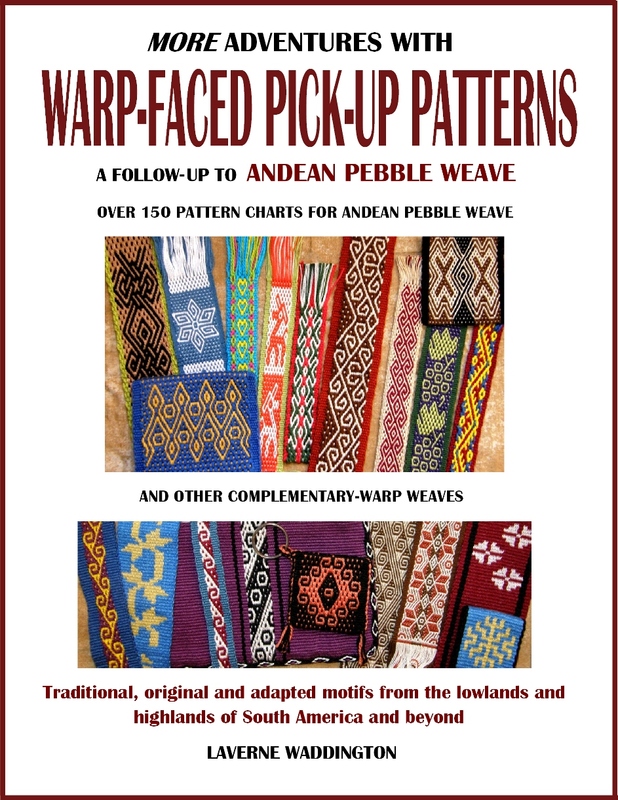 Below are some of the variations of the al’ouerjan pattern which were woven by Helena in Brazil. This tutorial is not intended for beginners. 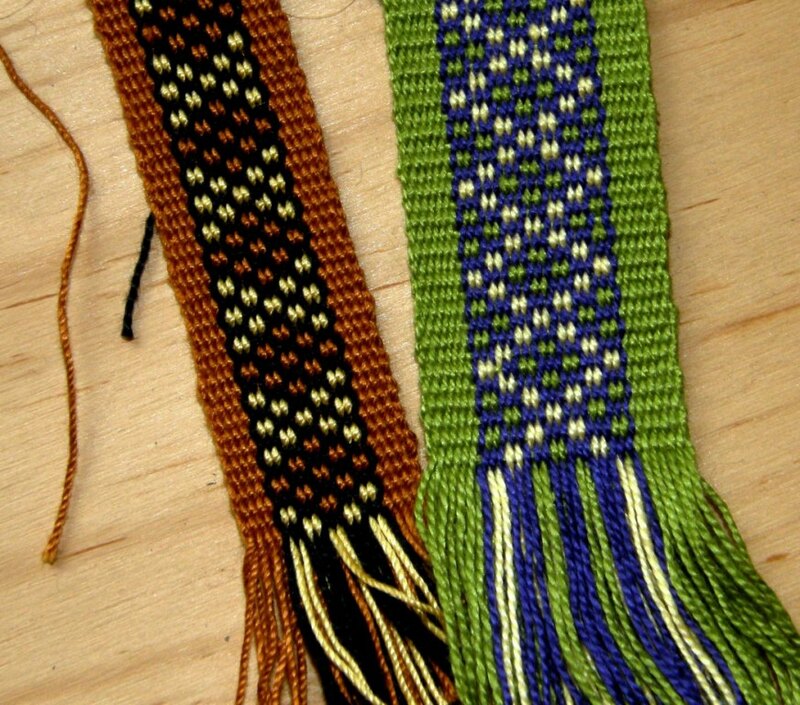 The technique used for weaving this design is warp substitution. A tutorial for this technique can be found here. I suggest following that tutorial and becoming comfortable with the practice of warp substitution before attempting this one. Instructions for one way to secure the long floats that are typically created on the back of warp substitution pieces can be found within this blog post. 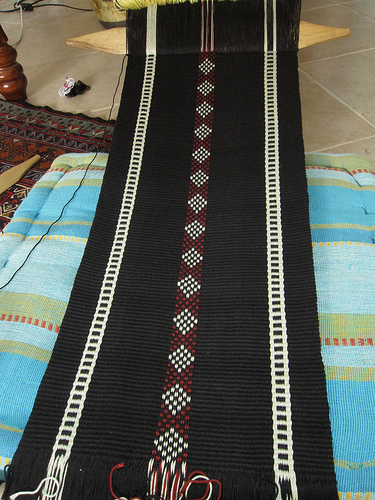 Here is a strip of the beautiful al’ouerjan pattern in a piece woven by Tracy Hudson. 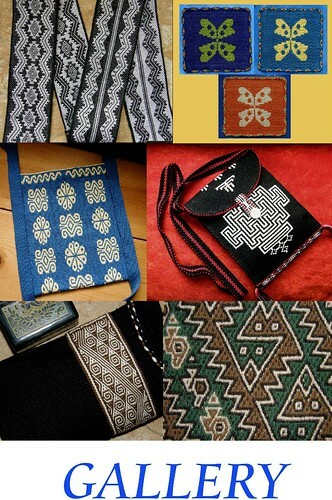 Tracy constantly inspires the backstrap weavers in the Ravelry Backstrap Weaving Group with her pictures of Bedouin textiles taken in Doha, Qatar where she currently lives, as well as in neighboring countries that she has visited. Here is the draft for what I am calling the “seven-square” design. If you look at the center of Tracy’s white diamond design above and count the black and white squares from right to left you will find that there are seven…four white separated by three black. 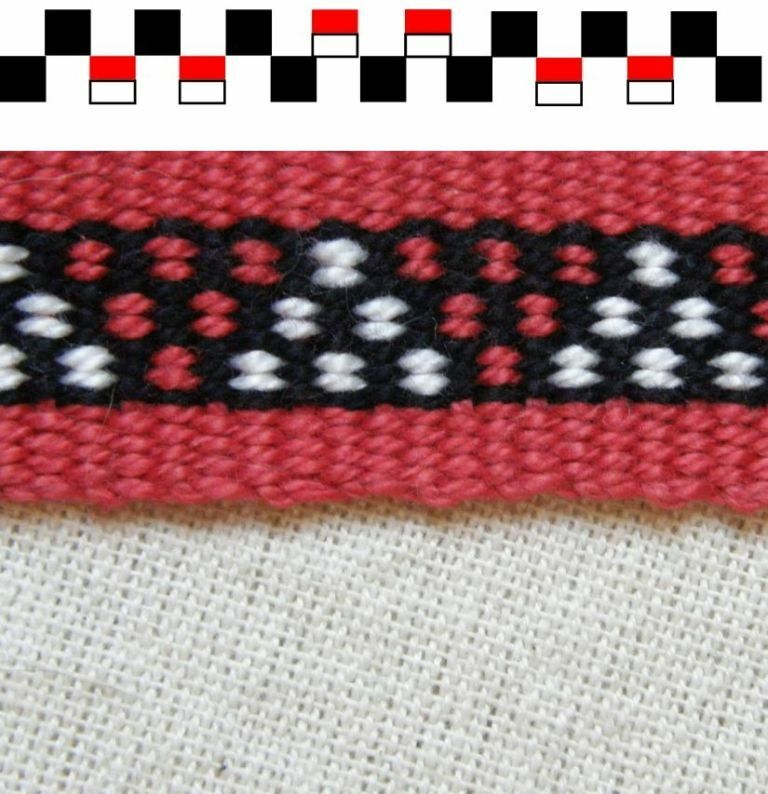 The split red and white squares indicate where red and white threads need to be warped together as one and these are the threads that are substituted one for the other when weaving. 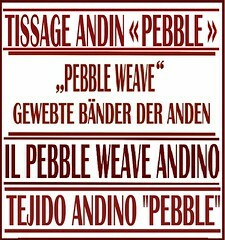 As I said last week, I am sure that inkle weavers will be very familiar with this kind of draft and creating a circular warp from this, as is used on inkle looms, is very straightforward. Above left you can see the circular warp that I removed on my inkle loom. When I have finished weaving, the warp will be cut and opened out to its full length. Above right you can see the difference between a circular warp and a single-plane one. 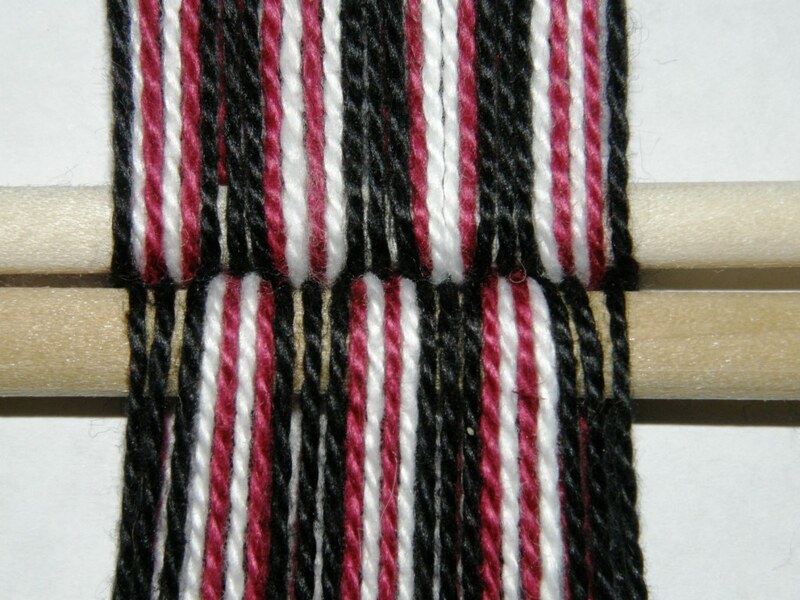 A circular warp for a backstrap loom can be easily wound by adding two additional posts (to hold the cross) to the basic two-stake warping set up. If you have an inkle loom, you may be able to plan the path of the warp so that you can use two of the inkle loom pegs as cross posts. Then it is just a matter of reading the draft from either end. The first black square tells you to wind one complete circuit with black thread which will go on one side of the cross. The second black square tells you to wind one complete circuit with black thread which will go on the other side of the cross. 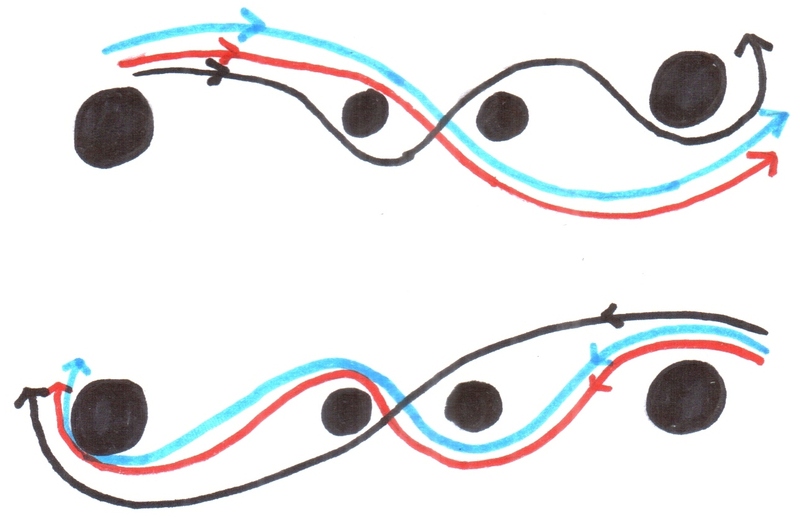 The drawing above shows these two circuits. Next on the draft there is a split red and white square which means that you will need to wind one full circuit of red and white threads together as if they were one thread, followed by a black and so on always remembering to respect the cross. Single-plane warps for this draft can be wound using either two or four stakes. This will give you one end on either side of the cross which is what the first pair of black squares on the draft represent. STEP B. Wind two revolutions of red, white and black together …(my picture, which shows one revolution, has red, blue and black threads for obvious reasons!) Try to separate the black thread from the red and white ones by keeping a finger or thumb between them so that they don’t twist. The two steps detailed above cover the first ten squares of the draft. You will see that these ten squares are then repeated. 6. Wind half a revolution of black. 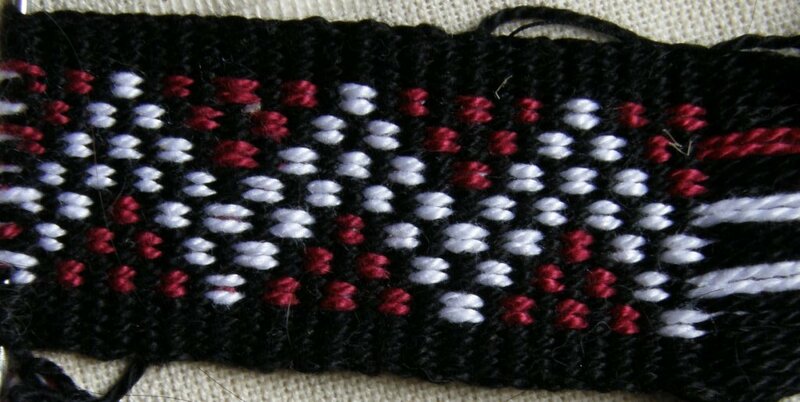 Then wind the other border by tying the border color thread onto the black. You will need to tie off the red and white threads to another warp at the stake where they ended. 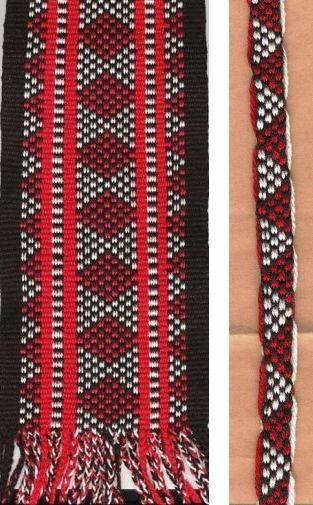 The following picture on the left shows a small part of what your cross in the pattern section will look like with the red, white and black threads together. 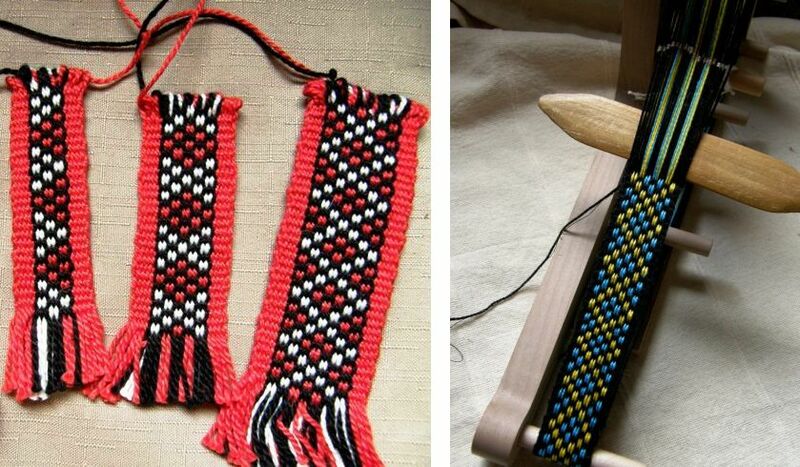 The picture on the right shows how you will, while following the draft, use your fingers as cross sticks to rearrange the warps separating the black from the red and white threads on either side of the cross. And what about that half revolution of black? That isn’t a problem. Just tie your border color onto it and continue winding. Having one end finish on the other stake does not interfere with anything. You can see the tail of the odd black warp in the picture above along with the weft tail. Once I withdraw the metal rod I will pass those two tails through the ends loops using a tapestry needle. This for me is the most efficient method as the colors are separated into the two sheds on the warping board itself. You need to be already familiar with four-stake warping if you wish to understand these instructions. You can watch a video of four-stake warping here. Wind a border, which is not shown in the above draft. Then follow the seven steps for the pattern. STEP 2: Start winding the three colors together (try to keep the black separated from the other two colors by keeping your thumb or finger between the threads so that they don’t twist). When you reach the cross posts, place the red and blue first on stake D and then the black on stake C as shown below. 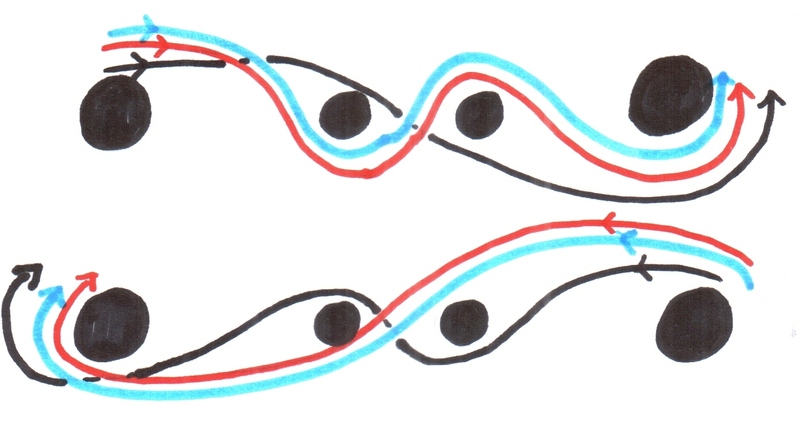 Then unite the three threads and turn them around stake B for the return path. Once again, when you reach the cross posts, first place the red and blue threads together on stake D followed by the black on stake C.
STEP 7: Wind a half revolution of black. Cut the black at stake B and tie on your border color. Wind the border. Finish at stake B and tie off. All these instructions have been based on the seven-square draft. Smaller or larger drafts can be used for other al ‘ouerjan designs by reducing or increasing the number of times you repeat the basic moves. For example, the “triangle” design (a three-square pattern) draft looks like this… It comprises steps 1, 2 and 3 followed by steps 6 and 7. Note that the seven-square zig zag design is warped differently. The pair of red and white squares in the very center of the draft should be warped as only white for this particular pattern. I hope that this is clear and that you will send me pictures of any projects you make with these designs. Here are some examples…a five-square design on the left and a seven-square design on the right. The seven- square diamond below left is a slight variation with each diamond separated from the next. Above left, three, five and seven square designs. 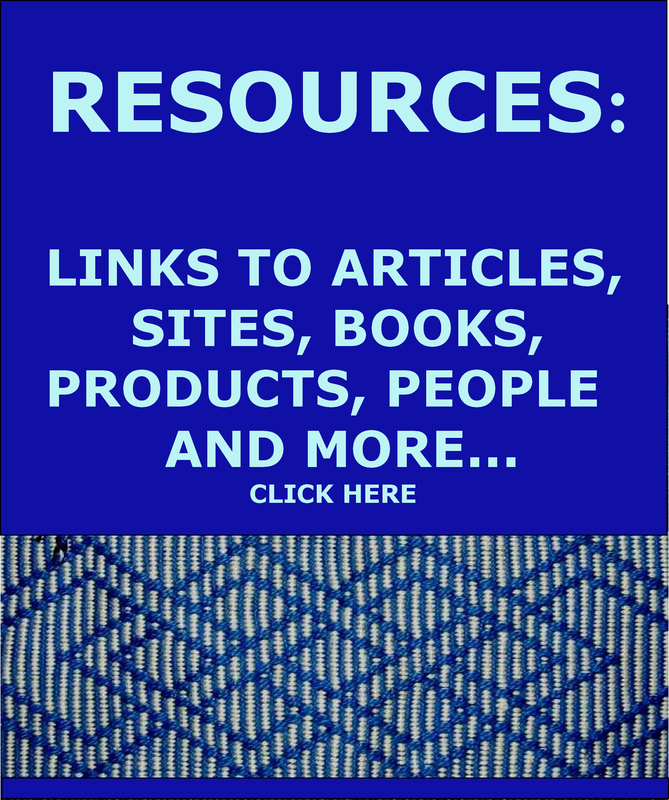 Look for more traditional Bedouin examples on Tracy’s blog. Thank you, Laverne!! This will be bookmarked forever. I’m flattered by your acknowledgements, while also being one of the people that needs this step-by-step explanation the most! A and B – perfectly clear. Now off to practice…. 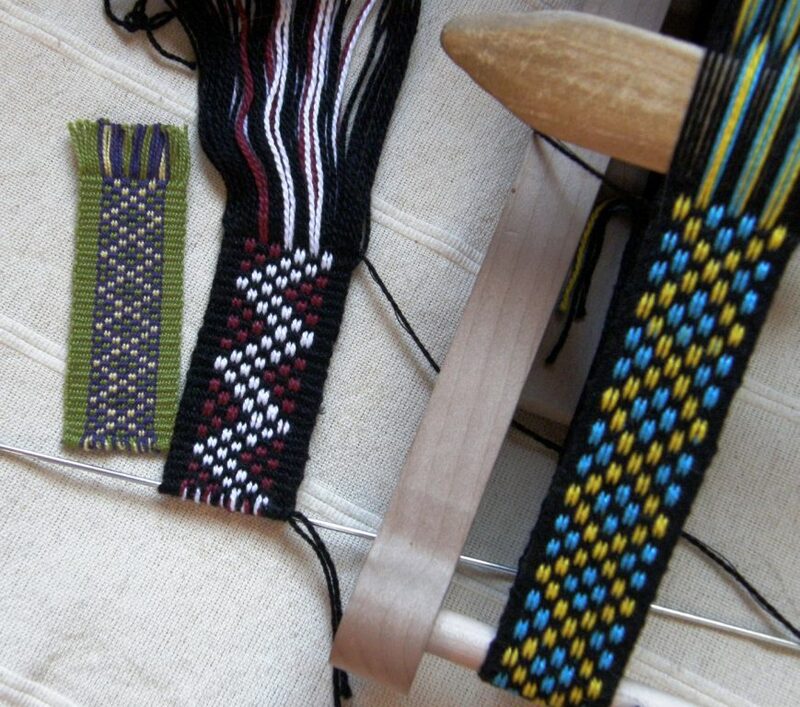 I am relatively new to inkle weaving and have fallen in love with it. The possibilities seem endless, and now this! Fantastic. Thank you for sharing. transmitir una energía maravillosa. Gracias por estar ahí. Thanks so much for sharing this beautiful technique and for sharing your expertise! This is inspiring!